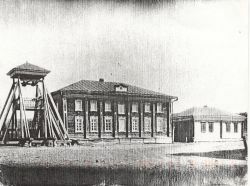 Georg Heinrich Margheim, Merkel, Saratov Province, Russia 1893. Standing: Henry M., Eva, Ferdinand Herman, Mollie, Johannes Heinrich. Sitting: Katherine, Eva Elizabeth (Evelyn), Georg Heinrich and Sophie. Heinrich Margheim and Eva Elisabeth Foos Family, Ship Manifest for SS Dresden, arriving Baltimore, Maryland 29 May 1902. Manifest lines 21 through 30: Heinrich Margheim, Eva Elisabeth Foos. Children: Katherine, Sophie, Ferdinand, Heinrich, Ludwig, Amalia, Eva, Johannes. Heinrich Margheim and Eva Elisabeth (Evelyn) Foos, City cemetery, Bazine, Ness County, Kansas 2008. From the Baltimore, Maryland listing of ship manifests the following was obtained: "S. S Dresden, sailing from Bremen, Germany May 15, 1902, arrived Baltimore May 29, 1902. It's manifest lists the family as follows: Passengers #21 through #30; Heinrich Margheim, age 50. Occupation: Farmer. Able to read and write: Yes on both counts. Nationality: Russian. Last residence: Makarowka (Merkel). Destination: Bison, Kansas. By whom passage paid: Self. Amount of cash possessed: $50.00. Name and address of relative in USA: Father-in-law, George Foos, Bison, Kansas. Wife: Eva, age 40, born in Russia. Children: Katherine, age 19; Sophia, age 17; Ferdinand, age 15; Heinrich, age 11; Ludwig, age 15; Amalia, age 7; Johannes, age 4; Eva, age 2. The Kansas 1910 US census for Ness County, Bazine Township, Enumeration District 117, lists the family as follows: Family Group 104; Henry Margheim, age 56; born in Russia; came to the USA in 1901. Occupation: Farmer, General Farming. Wife: Eva, age 49, born in Russia, came to USA in 1901. Children: Henry, age 21; born in Russia; came to USA in 1901. Occupation: Laborer, Farm. Johannes, age 12; born in Russia; came to USA in 1901. (Couple married for 26 years, had 10 children, 8 living). The 1920 Kansas US census for Ness County listed the family as follows: Henry L., age 69, born in Russia, came to the USA in 1902, lived in Bazine Township. Wife: Eva, age 63, born in Russia. Lived with son, John H. Margheim.